JUMLA, Sep 1: The demand for agricultural products of Jumla has increased in recent months, due to regular operation of the Surkhet–Jumla road. The road connectivity has expanded the markets of Jumli Marsi rice, red rice, buckwheat, herbs tea, nuts, dried apple, soybean and other agricultural products of Jumla, according to local farmers. "I have experienced a growing demand for our agro products compared to the past days," said Tikaraj Dhital, a trader from Dhapa of Sija Rural Municipality in the district. "An increasing demand for our organic products has encouraged farmers like me. And as a support to the farmers, traders are collecting products right from the villages." A collection center for agricultural products has also been established at Chandannath Municipality for ease of the farmers. Organic products are being collected from collection centers of Nagma and Sija as well. Dhital's and other farmers' products are exported to the markets of Surkhet, Nepalgunj, Pokhara, Butwal, Narayanghat, Chitwan and other cities, while they import fruits and vegetables from Surkhet and Nepalgunj. 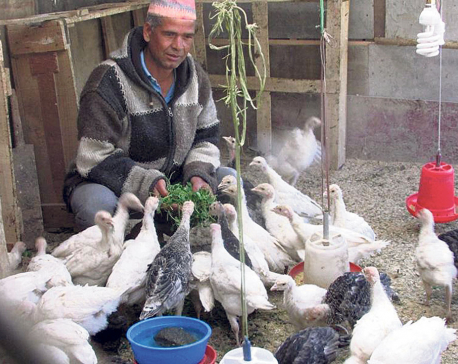 "I have hired few agents to visit farmers in different villages and to collect their products," Dhital said. On the other hand, District Agriculture Development Office (DADO) of Jumla has been providing various programs to support the farmers. "We are running programs such as training and providing various supports to the farmers," said Balakram Devkota, planning officer of DADO.